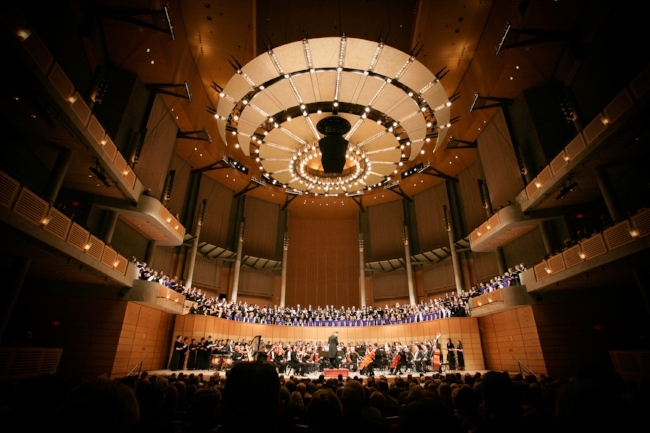 Students at UBC School of Music have the opportunity to rehearse and perform in three different state-of-the-art performance facilities on UBC's Vancouver campus: the Chan Centre for the Performing Arts, Old Auditorium, and Roy Barnett Hall. Home to our large ensembles, the Chan Centre for the Performing Arts is considered one of North America’s premier venues thanks to its state-of-the-art acoustics. The Old Auditorium boasts a 60-person orchestra pit with mechanical lift, two rehearsal halls, and a 2000 sq ft costume shop, ideal for our elaborate opera performances. Roy Barnett Recital Hall is an intimate space with outstanding acoustics that functions both as an everyday performance venue and a music laboratory for students. Interested in booking one of our venues? Find out more.